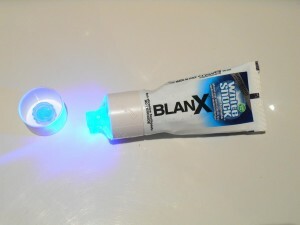 Blanx White Shock is a whitening toothpaste with a difference, this one is supplied with a little LED light in the lid that will ( it is claimed) help activate and accelerate the whitening effect of the active ingredient in the toothpaste. A bit of a gimmick?? – We thought so…. The Led light fitting is a separate part of the kit, you buy them separately and they will last for more than one tube of toothpaste. Actilux is the whitening agent in the toothpaste, it has a photo catalytic effect, it breaks down stains and dirt using light, these being washed away by saliva. The LED light activates the Actilux as its passed through the tube and you can also hold the light up against your teeth for a minute to accelerate the effects. Well it has a pleasant minty taste and we have to say that there was a slight improvement over a period of two weeks – nothing mind blowing but a definite improvement. For a toothpaste its not cheap… you buy the toothpaste and the LED separately and the two will cost you £9.36 in your local Boots… refills will cost you £3.74 as the LED light will last for a few tubes. As a toothpaste, Blanx has always worked well as a cleaning agent, but the original was not that great at actual whitening. Blanx White Shock does deliver on its promises, you should get whiter teeth with this product, but do not expect miracle results… you should get an improvement of 1 maybe 2 shades of white at best. If you are looking for some real whitening effects, then check out our page on the top rated teeth whitening kits available today. These deliver really impressive results with our top rated product actually whitening teeth by up to 11 shades of white in as little as 2 weeks.